Rainscreen manufacturer and Euroclad company Booth Muirie has just completed a great new product brochure, with updated system diagrams, additional case studies, technical advice on fire and thermal performance, and a general update of all the information it contains. 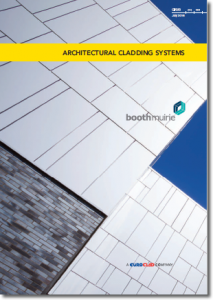 The brochure not only serves to illustrate what rainscreen products are available from Booth Muirie but also provides advice on some of the key issues surrounding rainscreen cladding. It also includes information on Booth Muirie’s engineered support products – BML Smart Fixing Systems – as well as other components, such as fixings and firestops.